The all-instrumental ‘Infinite Mind’ is due March 29. Learn the Solo in Born of Osiris' "Silence the Echo"
Lee McKinney teaches GW readers the searing solo from Born of Osiris' latest single. Born of Osiris Premiere Music Video for "Divergency"
Born of Osiris have released a new music video for "Divergency." You can check it out below. Born of Osiris will release their new album August 20. You can hear the new track, "M∆CHINE," now by heading to SumerianRecords.com/BornOfOsiris or by watching the promo video below. He and his Born of Osiris bandmates live together in a suburban Chicago house. But with the recent departure of Jason Richardson, Lee McKinney has the guitar slot all to himself. Born of Osiris Release Music Video for "Follow the Signs"
Chicago's Born of Osiris have just premiered a new music video for their song "Follow the Signs." You can check out the Andrew Pulaski-directed clip below. 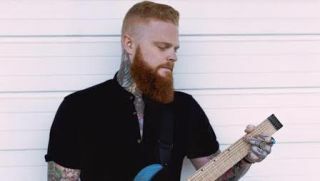 Progressive metal act Born of Osiris have announced the departure of guitarist Jason Richardson, and have also put out a notice for submissions for the vacant guitar spot.